In November of last year, I decided to have a go at starting Wednesday Meditations in London. Previously, I worried that nobody would come, who would I invite, what if it didn’t feel like a Santa Clara Wednesday, etc. And then at some point, I finally just dropped all of that mental drama and sent out an email inviting folks to come along to a Wednesday meditation at our home on December 3rd. I wouldn’t be telling the truth if I said I wasn’t slightly anxious about who was coming, as I didn’t personally know anyone who I invited or who RSVP’ed, whether they would even show up at all, or how it would all work out on the night, as I’d never actually hosted a Wednesday prior to this. But surely, at 6:45pm our first guests started to arrive and then at 7:00pm, the 6 of us sat together in silence for an hour, introduced ourselves and discussed the iJourney thought-of-the-week and then shared a home-cooked vegetarian dinner together. From that tiny seed, once-a-month Wednesdays in London were born and have been happening for the past 9 months. It’s been such a blessing for me to have the opportunity to share the space for people to come and just “be” and to learn from each other's experiences as we all try to be present during this journey through life. Serendipity provided us the opportunity to share the space with some amazing guest speakers in the months that followed. In May, we were blessed to have Jayeshbhai and Anarben of Manav Sadhna join us for a Circle of Sharing on the afternoon of May 31st, during their trip to London. Nearly 30 of us gathered around in a circle in our living room – we sat in silence for an hour and then listened intently to Jayeshbhai and Anarben’s life stories. Our hearts were filled with love and inspiration from spending time with two incredible people whose service journeys light up the world. Everyone who came was so moved to be the change in their own lives, as they were gifted with all sorts of goodies from the children at Manav Sadhna including chains and be-the-change magnets and most importantly so much love and compassion from Jayeshbhai and Anarben themselves. A month later, another visitor happened to be in London for a week, and it was none other than the famous doctor-poet Sri, who had just recently returned from Burundi! Sri kindly shared an evening to be part of a Circle of Sharing at our home on July 16th, where we heard about the truly life-saving work that the doctor-poet undertook during his 5 months in Kigutu. The real-life be-the-change inspiration Sri offered was the perfect energy to fuel the discussion that followed over dinner that evening, as we discussed ideas for a Smile Event in London! 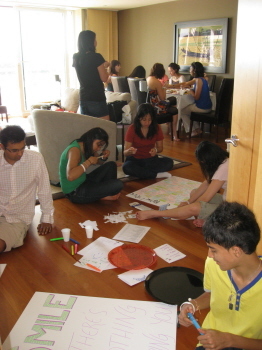 That evening, we picked an idea that got everyone excited and moved ahead with planning it – we were going to bake and decorate 200 cupcakes, buy a bunch of sweets, make some fun smile posters and give it all away at Hyde Park! A team of 6 people spent a month planning every fine detail from inviting friends to get involved, baking cupcakes ahead of time, buying supplies, getting t-shirts and a banner made and visiting the park ahead of time to find the perfect spot for the event. It all came together last Sunday, August 23rd, as 17 of us joined hearts to spread smiles in London! Everyone arrived at our home in the morning, rolled up their sleeves and got busy with preparations for the event: some made colourful posters with fun phrases on them like “Smile, there’s nothing stopping you”, “Give me a smile” and “Help Wanted: Smiles Needed”; the cooking team made icing and beautifully decorated over 200 cupcakes with colourful designs and smiley faces that would be hard to refuse; some wrote inspiring kindness quotes on napkins to serve with the cupcakes; and others planted a GenerosiTree on a big board filled with loads of kindness ideas that people could pick off. We had a brief discussion over lunch to understand more deeply why we are doing this, to review plans for the afternoon and to go through commonly asked questions and their answers, so that everyone felt prepared before heading to the park. 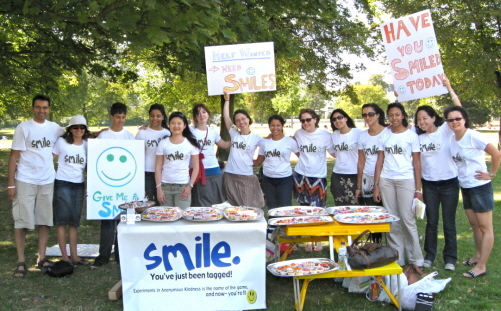 At 2pm, we arrived on the Broad Walk at Hyde Park, set-up our goodies, split up into teams and began spreading smiles! The couple of hours provided us all with the ultimate experience to cultivate kindness in our own hearts and connect with people in that spirit! 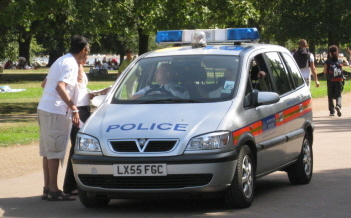 Our afternoon started with a visit from the Police – and no, it wasn’t the parks police -- it was the Metropolitan Police! I must admit, I got a little nervous as I thought they had stopped two of our friends in their tracks and I was worried that the police would ask why we didn’t have a permit to give out food, etc. Only later did I find out that in fact Binisha and Ashwin had screamed, “Smile!” at the police in the car to stop them, walked right up with big smiles on their faces and tagged them with cupcakes and smile cards! The police were intrigued by what our friends shared with them, and though they politely declined the offer of a cupcake, they took a smile card and said they’d like to pay-it-forward, as it’s sometimes challenging to make people smile in their profession. Passersby from around the world (London is a very international city and popular tourist destination) stopped by to give us a smile, find out what we’re doing and why we’re doing it, take photos and videos, and to take a smile card along with them so that they could pay-it-forward. 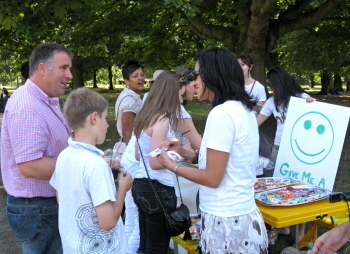 Some teams went around the park in pairs with a smile poster and a tray of cupcakes and sweets, while others engaged in lively conversations with people who stopped by the table. We even had a few in-house photographers capturing all of the moments! Children were so fascinated by the GenerosiTree and loved that they could literally pick off a kindness idea and take it with them to remind them to pay-it-forward! Some people covered their eyes, so as to pick an idea randomly, while others studied all the ideas very carefully before they picked one that struck a chord in them. Other adults and parents came by and said they were so delighted to see people doing something like this – some wondered if we’re there every week! Some were cynical (surprise, surprise, this is London after all :)), but we saw many of the cynics transformed through the course of a heart-to-heart conversation with a friendly person in a SMILE t-shirt and by the end, many had an epiphany of, “Oh, I get it!” with big smiles on their faces. Even Stirling, the adorable black lab, joined us for part of the day playing with his ball with a smiley face! Some folks met people who actually paid the kindness forward right in front of their eyes -- from making strangers smile at any cost to hi-5’ing random people in the park, including Jo as she walked along with a smile poster! Aditi came across a little boy who smiled big before helping himself to a cupcake and then told his little sister that she had to show her best smile before she could have one too -- and after a little bit of convincing, she did and it was so cute! Rakhee had a lengthy conversation with a typically cynical Londoner, who couldn’t get her head around why anybody would do this. Then as she began to share stories and explain how it all works, the lady suddenly said, “Oh, I get it. It’s like when I leave change in the ticket machine at a train station for the next person to use or when I leave unused parking passes at the ticket machine for others to use.” Rakhee had changed the lense through which this lady sees the world! Jenny's heart melted when she saw the excitement in children's eyes as they reached over to pick an idea from the GenerosiTree and then share it with their parents. Jo and Priya thought the highlight of the day was going to be decorating cupcakes until they got to the park and had even more fun giving them all away and spreading smiles! If you want to see the story of our experience in photos, have a look! Trishna, this is so inspiring! As you pointed out, it all came together when you took the initiative, faced the risks, and commited to being the change! Bravo. I've heard so many people already talk about it, and I can only imagine the kind of ripples this will create in London. Oh, and that photo with all of you in those Smile t-shirts -- priceless! I second Nipun's Bravo! Taking that leap from thinking to doing is one of the great leaps. Wonderful to hear about your collective day of pure sharing in Hyde Park. it's great to hear, trishna, that you continually expand the bounds of your heart and support others in doing the same! Trishna!!! This is so great! Loved all the stories. Oh - and those cupcakes! I'm smiling really big - can I get one?!? How lovely and inspiring! Something to soothe the pain and sadness I feel over the ubiquotious mercenary spirit rampant in the world. That is so inspiring Trishna! 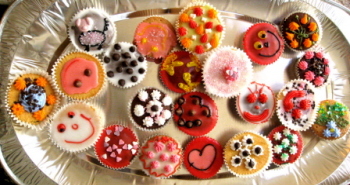 Each cup cake looks so heartily done. No wonder that it all came full circle. Congratulations for pulling it off! I really want to get involved on the next one. Trisha, Nipun has 'stolen' my words but I'm so pleased to hear about your joyous journey. It's truly inspiring that your thought and action made so many people smile and happy. Arun - thanks for your lovely words and you are most welcome to join the journey here at ServiceSpace any time :) Are you based in London?